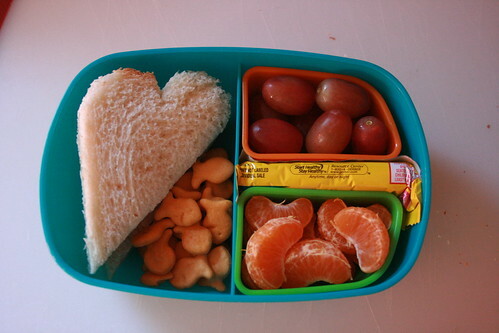 This is a very simple little bento. 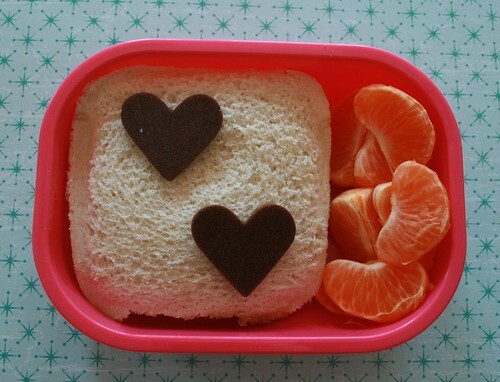 It consists of a cheese sandwich, clementine oranges and fruit leather. I used a mini-sized heart cookie cutter on the fruit leather. 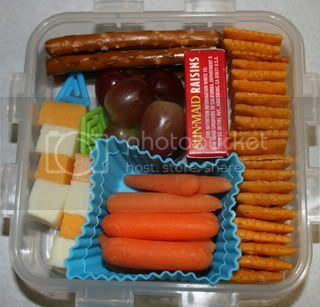 This is a bento lunch for my 2yo daughter to take to preschool. It's a pretty typical bento for her. - On the left side there are cheese cubes and a half sandwich of peanut butter & jelly. Luckily there are no allergies in her class so we don't have to avoid sending in an old fashioned PB&J. 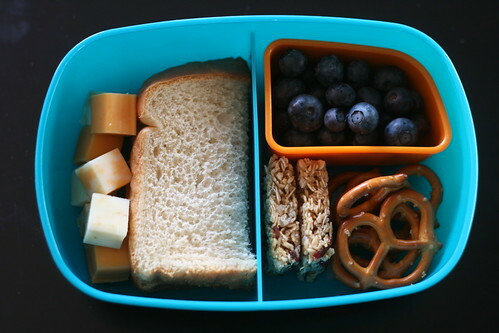 - On the right side there are fresh blueberries in the top dish with a granola bar and some pretzels to the side. The box I used to pack this lunch can be found really easily, it's made by the Sassy brand and you can order it from Amazon. I think it's also available at Babies-R-Us, at least I remember seeing one there a year or so ago when I was there last. 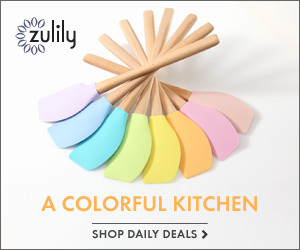 It comes with 3 inner compartments and each one has its own tight-fitting lid to keep contents from dripping. I don't usually use the inner lids unless I'm packing something extra messy - which I try not to do for preschool. This box works very well for my daughter's lunch as it holds just the right amount of food for her. On this day the box came home with only 2 pretzels left uneaten. 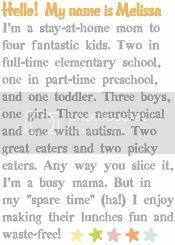 #1 - the whole meal is presented at once, no baggies and obstacles in the way to distract the child from eating. At my son's cafeteria there are only 3 lunch ladies to supervise over a hundred children. If my son needed assistance getting a package open he could have his arm in the arm waiting to be helped for several minutes. And for a lunch period of 25 minutes, that can be the difference between him having enough time to finish his lunch and not. #2 - there is no (or very little) waste! No baggies and disposable containers to fill trash cans and overflowing landfills. Just yummy food to fill hungry bellies. Packed in my favorite box for her lunches, a Sassy Baby Mealtime On the Go Feeding Set. Such a great size for her age...and appetite! On this day she had a half sandwich, Goldfish crackers, purple grapes, clementine oranges, and tucked in between the grapes and oranges is a granola bar. I would not usually put a wrapped product in a bento, but this day I did because I wasn't sure if she would want it and they go stale quite quickly once unwrapped. 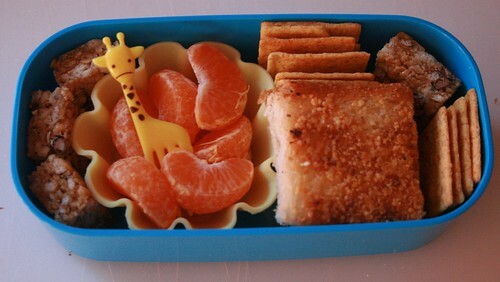 This bento was made for my 7 year-old son as a snack. This bento is more carb-heavy than I'd prefer and also more monotone than I'd prefer, this one being very tan and pale. It's packed using only the top tier of a two tier "authentic" bento box. 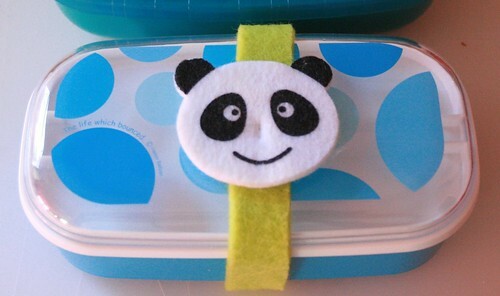 Most of the inexpensive "real" bento boxes do not have securely fastening lids and require a band to keep closed. This one is mostly made of felt with an elastic segment on the back to make it stretchy. 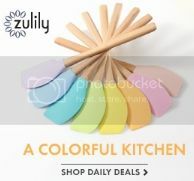 The clear polka-dot section of the lid is removable to make an extra storage space for things like utensils or (traditionally), chopsticks. Sometimes I tuck a napkin in there, but usually I leave it empty. I'm gonna mix it up and describe the contents from right to left this time (got to keep you on your toes!) 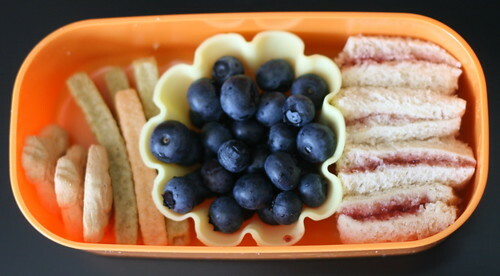 - little jelly sandwiches, blueberries in a silicone cup, Veggie Straws, and a few cookies. I got those cookies from Costco. They are organic animal cracker type cookies shaped in Winnie-the-Pooh characters. Let me tell you, these darn cookies are lasting forrreverrrr. Good grief. Some things do not need to be bought in bulk. This is one of them.